I have actually never bought used clothing but that may soon change. You can easily buy like new kids’ clothing online. ThredUp is an online consignment store that sells and buys name brand gently used clothes and shoes. My son goes through clothes quickly. He grows so fast and is always wearing the knees out of his jeans. His feet seem to grow like a weed. He’s seven and wears a size 5. To be able to save a little money on his clothing would be great especially if it’s just like new. ThredUp fully inspect the clothes they are selling to you before they are listed for sale on the site. Each item is pictured and displayed for you to see very clearly. So, you are not just taking a chance at getting something good….you know what you are getting! You can even hover over an item and it will magnify the picture so you can examine the item closely. Also you get free shipping when you order $40+ or a flat rate of $6.95 otherwise. When you place an order you will automatically receive a bag to fill with clothes to sell to ThredUp. They have included prepaid postage for USPS and UPS. If you wish not to purchase but do want to sell to them you can order a bag to be shipped to you. If you have never used ThredUp before you will want to find a friend’s referral link to sign-up on. You will automatically see a $10 coupon when you arrive at checkout for the first time if you sign up using a referral link. Who would like a referral link?! Here you go: CLICK HERE TO SIGN UP AND GET YOUR FREE $10 TO SPEND AT ThredUp. ThredUp will also give you a $10 credit for every new member who signs up and makes their first purchase through your referral code! With a special thank you to co-host: Iowa Mom, and Giveaway Bandit. Giveaway ends Feb 7th at 11:59pm, open to US only, ages 18+. To enter please use the Rafflecopter form below. Good luck. Disclosure: I not did received compensation for this publication. My opinions are my own and may differ from those of your own. Giveaway Bandit is not responsible for sponsor prize shipment. Toddler clothes for my fast growing nephew! For my son who is 3.5 years olds, thanks for a chance!! I would shop for the great deals. i love all the cute shorts they have! 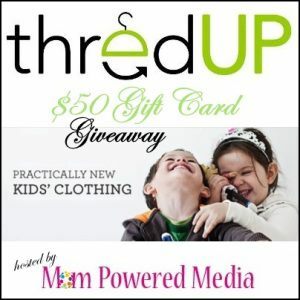 I would shop at ThredUP for great girls clothing! there is this really cure furry vest i’d love to get for one of my girls! I would shop for spring clothes for my daughter, probably jeans and tshirts. I’d shop mostly for jeans and shirts but would probably buy a lot of stuff. Jeans for my son – he grows out of them so fast! Boys Jackets and Sweatshirts for my son. Thanks for the great contest……..spring clothes!